Czech President Milos Zeman engages the head of the social democrats (CSSD) Bohuslav Sobotka to form a new cabinet. The elections at the end of October brought surprising results. Although the social democrats (CSSD) won 20.5% of the votes, the result was substantially below the expectations. 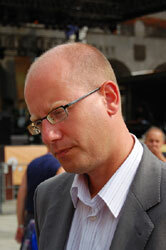 Party leader Bohuslav Sobotka hoped to exceed 30% of the votes. This article includes a total of 241 words.